My fourth cyclosportive this June (versus only three the previous 42 years). I don’t think I am getting faster. But at least the pain is less of a surprise. Starting from the very scenic ski station of Le Grand Bornand, this was a beautiful and challenging 120 kilometre course, with +2700 metres of vertical ascent (+9000 feet). Martin joined me for this adventure. Barry managed to register but struggled from that point on. Four climbs starting with the easier side of Col de la Croix Fry. A nice appetizer. Then a long pleasant stretch including Col des Fleuries. And then things got hard. First, a 500 metre climb up to Mont Saxonnex through a stunning gorge on nice shaded roads – but incredibly steep. Then, up Col de la Colombiere (not again!). Ouch those last three kilometres never get easier. I am filled with envy! What a beautiful ride–you will be totally prepared for the Tour d’Enfer. The cyclosportifs are fun and I am glad that you are taking advantage of them now. This was the third year we did La Grand Bo. The organisers reversed the route this year, which I think made it quite considerably harder. Also. I’m less fit and a lot heavier than in previous years. 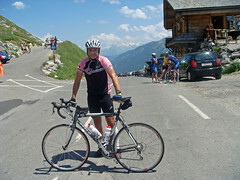 The ride is fantastic, although the Colombierre is, as you say, a hell of a climb. You sure are doing some fantastic rides of late, but I think it would take me about 8-10 hours to finish that course. Am I right that you did it in 5:47? I also know what you mean about the pain being less of a surprise….i guess a large part of performing well in these type of rides is mental. yes that time sounds right. My one complaint in these events is that I descend so slowly that I always pass certain people several times – I am a coward going downhill! Will… great as always. Congrats on the ride… and video. I love the TIRED part… it really gets the viewer on the hills with you. I can relate! I was going to take a little camera with me on the Blood ,Sweat and Gears ride but it wasn’t mine and I was worried I would get it wet. Then, it never rained. Go figure. Hi Will! So, I’m registered for La Grand Bo 2010, and getting a bit… scared! When you did the cyclo in 2008, did it go up Col de Romme before Colombiere? Did they add Romme to the mix?? Won’t this just be a really painful end?? (I’ve never ridden up Col de Romme…) Hope all is well with you! Wow, yes, the addition of Col de Romme is new – I guess since it was in the Tour de France last year. Romme is very, very steep. PS – Not sure, but I thought I saw you descending Colombiere on the holiday Monday several weeks back. Ah yes, it must have been me!! Can I tell you how *disappointed* I was that the restaurant at the summit was closed?? I had the money in my pocket, pushed on those last 3 interminable kilometers, foolishly thinking I’d be very soon enjoying a well-earned break and some refreshments 🙁 Argh!! Yikes, the profile of Col de Romme looks as scary as I thought… I’ll let you know how the cyclo goes! Thanks for the info Will, and pedal on! !